How to install a Solar Double Gate Operator System without trenching for the slave motor. The answer is surprisingly simple, especially if cost is not the number 1 criteria for the end user (customer). Mark Gruber of Yass Farm Service faced this dilemma and came up with a solution that required a bit of lateral thinking. It is often easy to assume that price is a prime factor for a customer. Mark’s customer did not want his new driveway cut or dug in to. Mark inspected the site and found a drain-pipe about 40 metres away. For various reasons, that proved to not be as practical an option for getting the 12V DC cable across the other side of the driveway (80+ metres of cable…). So, Mark quoted on installing 2 single gate operators and synchronising them to the customer’s 5 remote controls. Although that proved to be a more expensive option by $800+, it met the customer’s demand that his driveway not be cut. Consequently, Yass Farm Service was chosen to do the installation. The customer’s driveway looks just as good as it ever did, his property is secure and going through his gateway is now convenient. When are you going to get your system installed? For an Australian-Made Solar-powered, single gate operator D.I.Y. kit, the price is $1,195.00 for the XP series SPXP200K. Perhaps a solar slide gate operator suits your purposes better? It’s hard to go past the Automaxx500 operator. 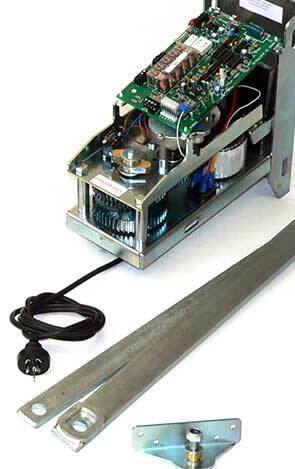 For just $995, you can automate your existing slide-gate. If you are installing a new slide gate, contact us about some other items you may need to get a new gate installed with all the right hardware. If you do not need solar power, the Automaxx 500 240V kit is just $895. What do you get in your kit? Photos of your new ‘XP’ Solar-powered Single gate automation kit from SUN-POWER Auto Gates.